A well kitted out cage can really enhance a rats life, picking the right equipment can also make your life as a rat owner much easier. Below are some discussion on the different types of accessories available and some things to consider when choosing them. A fresh clean supply of water is one of the most fundamental things required for any pet, rats are no different. In the wild they can survive for long periods of time without water but this is not ideal for their health and our pet rats are only distant relatives to those hardy wild animals. There are 2 main forms of water distribution available. These are the water bottle or bowl. 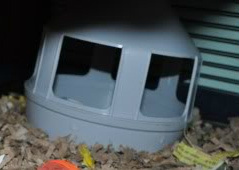 Ideally you should let your rat have access to both kinds of water as this not only provides a more interesting cage but also lets the fussier rats have options. The water bowl allows the rat not only to drink but also to wash and play in the water. This means that the water bowl should be robust and tricky to move around. The best form of water bowl can be clipped to the side of the cage off the floor, this prevents spillages (unless the rat manages to slip and plant its large bottom in the bowl splashing most of the water out) and keeps much litter/food/bedding being kicked in. These can generally be found in the parrot/bird section of most pet shops (called coup cups or something similar) though they are beginning to be sold for other animals. An alternative is to use a low but heavy earthenware bowl, such as a dog, cat or rabbit bowl, these also double as a paddling pool for summer or, with the addition of frozen peas, a fun game. As the water is used for washing and playing as well as drinking it will need changing more frequently than the water in a bottle and the rats will appreciate clean fresh water more. The water bottle comes in 3 main forms, the traditional ball valve water bottle, the pin valve and the bird/parrot gravity fed bottle which aren’t really suitable for rats. The traditional style water bottle is the most widely used and it is possible to get some that do not leak and are quiet and good quality. It is worth investing in one of the more expensive versions as they are can more consistent, quieter and leak less. The pin valve water bottles can be a good option though some rats struggle to figure them out. They generally leak less than the ball valve bottles but also can be too tough for ratty tongues to lick. Check the strength of the spring on these bottles before buying them for your rats, it should be loose and easily pushed in and out, too much resistance and they’re unsuitable for small animals. The pin valve bottles do have one advantage over the ball valves as the animal can hold them open (normally with their teeth though I know a rabbit that uses her top lip) and drink freely from the water that flows, this often suits the more lazy animal once they’ve figured them out. Generally speaking rats do not need, and in fact benefit from not having a food bowl for their dry mix. Instead they gain a lot of enrichment from foraging for their food with Scatter Feeding (more info in the feeding section of the forum). Food bowls should generally be kept for wet food only. If you’d need to use a food bowl for some reason there are two main forms of food dispenser; the straight forward bowl and the gravity feeder. Both have their advantages and disadvantages. Gravity feeders can generally be used to hold larger amounts of food often off floor level and can sometimes be filled from outside the cage. These are traditionally used by large scale breeders and rodent farms but aren’t a usually a good option for rats. Generally speaking though they are not suitable as you want to restrict the amount of food they have available to prevent both selective feeding and over eating. The second and most widely used option is the food bowl. This should generally be a large wide heavy bowl such as an earthenware dog or rabbit bowl as otherwise it will end up upside down or placed neatly on top of something it really shouldn’t have been near. Where heavy bowls are used they should be placed on the bottom floor of the cage to prevent accidents. As with water bowls coup cups can provide a great alternative as they can be attached firmly to the bars anywhere in the cage with the only worry being that the rats will kick the food out and all over. These should be used with caution with messy food such as berries as any food bowl placed high up has a greater spraying range. Messy food is often best served on the bottom floor the day before clean out. For more approaches and methods of feeding please see the feeding section. When choosing a litter tray it’s worth looking into the different types available. 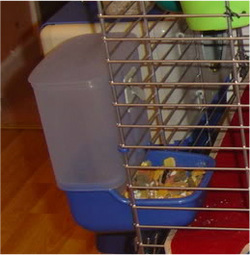 A corner style litter trays can provide more security to some rats. The also are easy to attach to cage bars, either using the hooks some have built in or drilled holes and tough garden wire/cable ties (see DIY section for more information). Make sure the litter tray is big enough for at least two rats to fit in to, generally rabbit sized litter trays are a good option, as rats like to dig, play and often sleep in there litter trays too. They also make great shelves when firmly attached to the bars of tall cages and can be used to break drops or encourage rats to use the litter trays even when at the very top of the cage. Rectangular cat litter trays can also be used though these can be harder to attach to bars and are more suited to sitting on the floor. Any litter tray high up in the cage, e.g. on a shelf, needs to be secured as otherwise it could easily be pushed off and potentially injury your rats or at best create a big mess. The second option for litter trays is to modify a simple rectangular cat litter tray. Drill or melt (with a hot skewer) holes into all 4 corners and use either keyring fasteners or garden wire to fasten to the bars and you have a nice big litter tray that can also be used to hide food in. Rats in generally default to liking the option of a dark enclosed space. Rats left in the open permanently with no place to hide can become stressed, however with time they are likely to adapt and learn to prefer to sleep on a relatively open option particularly when temperatures are warm. 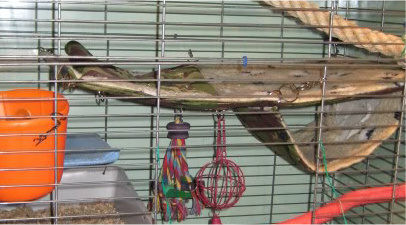 With young or nervous rats it is particularly useful to avoid letting them hide away in enclosed nesting boxes or houses, however once settled in offering one is usually appreciated, especially for old or infirm rats who may prefer a floor level house to climbing high in the cage (less likely with rats from us who seem determined to grow old disgracefully). There are several options for nesting boxes and houses, ranging from the; traditional house shape or a tube, upside down plant pots, low children’s plastic tubes or old shoe box. Generally trying the rats with a variety will help keep them stimulated and happy and give you something interesting to do. Nesting boxes can be bought or made though if you want your nesting box to last it’s best to use plastic or coated surfaces as opposed to cardboard, material or wood which will quickly become smelly. These are one of the most successful rat accessories around. Once they were a novelty item but have quickly become essential to any rat owner. It can be quick and easy to make your own out of an old towel or you can spend time making a more complex design out of specially bought material. There are also many rat shops out there stocking an assortment of hammocks and related items. Either way they will soon be filled with happy rats though it does take younger nervous rats time to get used to them. One thing to bear in mind when buying or making a hammock is whether your rats are chewers. Some girls have been known to destroy a hammock overnight whereas some more well behaved rats preserve there hammocks for months, even years, with barley a chew mark on them. If your rats are chewers its worth trying different materials, towel seems to be the most popular material for chewing as it is fibourous and easy to destroy. Some rats find fleece un-palatable and so entirely fleece hammocks may last longer. Tougher materials such as calico and denim tend to last longer, especially when edged by webbing. 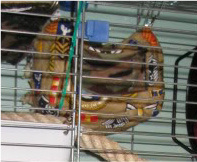 Hammocks generally are very well used in any cage and will need washing at least once a week. It's useful to get several changes of hammocks as your rats won't thank you if you run out. There are also many different styles and your rats may appreciate a choice. With any large cage, especially one full of enrichment a means to travel to each of these is required. Most rats will have no trouble climbing up the bars but some places are hard to reach by this method and older rats in particular struggle with bar climbing. However easy connections, such as tubes and ladders/ramps should be minimised unless the rats cannot get around without them. Fit healthy rats should not need help to get around there cage and giving them too much help will often result in unfit overweight rats. Ropes and sticks are a good alternative as they provide access and interest whilst still being a good challenge for rats. Sticks are particularly useful as they can help keep a rats nails short though they also can get a little smelly as they are porous and need a good scrub to clean. Ropes are also porous but have the advantage of being machine washable. They should be stretched taught between destinations to encourage climbing as loose or hanging ropes are often ignored by all but the most agile. To encourage rope use you can thread treats such as dog biscuits or bits of vegetables into the twisted rope. For older rats this rule of thumb changes, often elderly rats need a bit of extra help getting around, especially if they suffer from hind leg degeneration or another complaint that effects there mobility. In this case ramps and ladders should be provided to reach as many areas as possible. Plastic ramps often come with the cage and are particularly good for elderly rats as they provide enough grip to pull themselves up whilst still being slippy enough to slide along if needed.